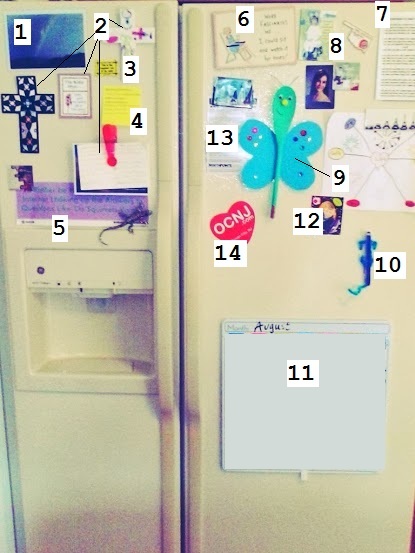 Linking up with the awesome Katie from Sluiter Nation and the wonderful Elaine from The Miss Elaine-ous Life for August’s Old School Blogging meme - What's on your Refrigerator? Click on over and check out what everyone else has contributed this month! Link yourself up for twice the fun! Ahhh, the refrigerator. That ubiquitous kitchen appliance, that storage unit of fresh food and leftovers and mystery tin-foiled portions of something formerly edible and WHOSE GLASS OF MILK IS THIS? We’ve had the same fridge for years, even moved it across several states – it is probably on its last legs as of this writing. I eye it with suspicion each time I tiptoe around it, for fear that I might jar it and cause it to malfunction, several shelves of items like half-full bottles of salad dressing, jars of pickles, containers of ricotta cheese and an as-yet unopened can of spray whipped cream (to be used only in emergencies) lost. Our cold foods are sitting ducks, living in there on borrowed time. Isn’t it cute how refrigerators only break down just after a huge grocery run? I mean, they are related to appliances like hot water heaters and air-conditioning units, which only seem to break down at the worst times like when you go away on vacation. Jerks. Everybody knows that the inside of the refrigerator is important, but the outside, gateway to every home's Arctic Circle, is just as important. Its expanse is the focal point of many kitchens, a conversation piece that early guests gape at while they pretend to help you get ready for a dinner party, where seldom-invited family members scrutinize to see if their picture is present. It can be a place to stash important coupons, reminders, schedules, and can serve as a bragging spot for families with children. Through the years, the outside of our fridge has seen hundreds of items: pictures and magnets, school schedules and coupons, newspaper clippings and cartoons, calendars and kid artwork, magnetic baby toys and always, always grubby fingerprints. And I am going to share with you what it looks like today. 1: This is a picture of the sky with a cloud in it that looks JUST LIKE AN ANGEL. We went out to dinner one night and there was a couple at the restaurant who had a zillion copies of this picture. They even had one framed. They had set up a display at their table and as people walked by in curiosity they told the story of the snapshot and what it meant to them. They gave a copy to everyone. It’s what they did – go out to eat and tell their story. It was a unique experience and the picture is completely amazing. We’ve had it up there for over ten years. People are weird. In a good way, lots of times. 2: Sunday School crosses and magnets and index cards with Bible verses on them. We are Christians, yay! 3: A little foamie sticker that I fished out of a tub we had when I did crafts with my little kids, which meant that I gave them a piece of printer paper and told them to cover it with foamies. It was a Spongebob Squarepants themed tub and this foamie on my fridge says “This is the best day of my week.” I need to be reminded to have a positive outlook, all the time. 5: A bumper sticker from my sister-in-law that says “I’d Rather Be Wasting Time On The Internet Looking Up Answers To Questions Like ‘Do Squirrels Vomit?’” She made it for me after I posted this as a status update on Facebook. It was my version of the “I’d Rather Be Fishing/Shopping/Playing Bingo” bumper stickers that you used to see all the time. It still rings true for me. I would rather be doing that than most anything else. And for the record, I never really found a straight answer to this question. Any squirrel experts out there? Please advise. 6: A plaque that my girlfriend got me that says “Work fascinates me… I could sit and watch it for hours!” My girlfriends think that I am lazy. They’re correct. 7: This beautiful poem, written by Medard Laz. It reads like a parent’s love letter to a child. I meant to type it up and make it look pretty, since it is a terrible copy from a book. But I never did. See #6 above. 8: Sassy magnets. One says “Gee, he went well with her drapes” and one says “Don’t let this happen to you.” My favorite: “I’m sorry… I just please need you to shut up for one minute.” A gift from my brother. It’s sometimes scary how well my loved ones know me. 9: Crafts and pictures. Butterfly and Loveburst by my ten-year-old. 10: Lizard magnets. Lizards are probably right up there with snakes and frogs as my most hated animals but somehow we display two lizard magnets on our fridge. 11: Whiteboard calendar. My daughter brought this home at the end of the school year last year. WHY do teachers send this crap home with their students? I do not want a whiteboard calendar. 12: Pictures of loved ones. My nephew and our neighbor are the superstars of our fridge these days. 13: A schedule of all the outdoor movies in our area this summer, which is stupid, since we don’t go to outdoor movies and are not planning on doing so. 14: An OCNJ magnet from our recent family trip. I intend to keep it there so when it’s thirty five degrees and rainy outside for seven months this fall/winter, I can remember lying on the beach in the warm, warm sand for a minute in the summertime. If you link up, don’t forget the button for your post at The Miss Elaine-ous Life! I love the squirrel quote bumper sticker and sassy magnets!! I'm also stealing the menu post-it idea. My husband asks me that question several times a day, argh. Yes! Be sure to label each meal with the day. Otherwise "What's for dinner?" turns into "Which one of these are we having tonight?" I also do weekly mealplans. It's a pain once a week because all I can think of is "get a personal chef and not worry about it anymore", but usually my husband ends up coming up with stuff. I like enlisting help too. That way, no one can complain. I love your idea of the personal chef. Lizards are weird. We have the butterfly thing that holds stuff with its tail, which is the world's tiniest clothespin so it can only hold a photo or small piece of paper. Dumb. This is a delightful look into why we are friends. I love Old School Blogging! You are so good to bring it back! Such a cool post idea. Our fridge is...intense. Yours looks so nice and streamlined I think I should probably just keep mine to myself. You have the BEST stuff on your fridge. Also every time you write anything anywhere I realize that we are very similar. It is almost eerie. But I like it, so there's that. Also, I do the same thing with our menu on a post it because it's one less question I have to answer. Now if Eddie would just learn to read. Grr.. I love the butterfly and Loveburst. One-of-a-kind art from our kids is always the best. It sure is! Now, how to store all this art forever? The very first thing I thought was, "OMG, why does she have a lizard magnet on her refrigerator?" I wouldn't be able to open the freezer door or get ice. They freak me out that much. I'm not quite as bad as that, but to be fair, one of the lizard magnets is glittery with shiny thread all over it, and the other is made out of a painted clothespin. I love the story of the couple and the cloud pic - what a cool experience to stumble into! Weird, yes, but definitely cool. It was very cool, even though they basically decorated their table with various manifestations of this picture. They were also very nice, so that made the whole thing seem a little less weird. I'd love to run into them again!